A new year brings exciting new beginnings and at the Columbus Zoo and The Wilds, that includes new animal births. 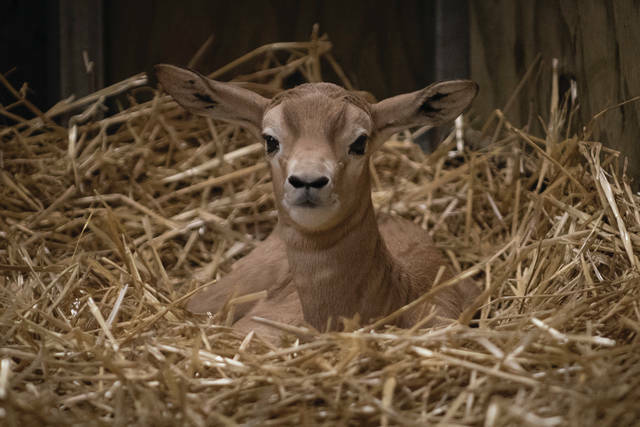 The Columbus Zoo and The Wilds were excited to welcome their first animal births of 2018 in early January – two dama gazelle calves and a common eland calf. 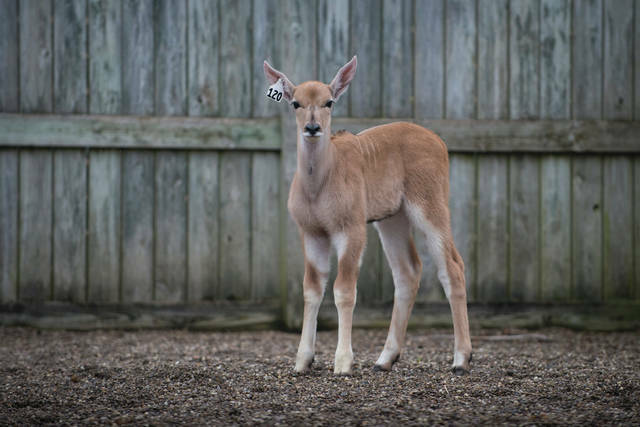 A male dama gazelle calf was born on Jan. 14, 2018 to mom, Layla, and dad, Zultan, at the Columbus Zoo. Just three days after the male calf’s birth, Zultan’s female calf was born to first-time mom, Susie Cruisie. As the calf initially experienced some nursing challenges, animal care staff stepped in to assist the calf by providing bottle feedings. The calf continues to be doing well and returns to the herd after each feeding. The calves have not yet received names and are bonding with their mothers in a behind-the-scenes area of the Heart of Africa region at the zoo. This region is currently closed for the winter months, but is scheduled to reopen in early May. The dama gazelles were recommended to breed as part of the Association of Zoos and Aquariums’ (AZA) Species Survival Plan® (SSP), a highly-managed program designed to ensure that populations of threatened and endangered species in human care are sustainable and genetically healthy to help protect these species’ future. Dama gazelles are critically endangered, which means they face a very high risk of extinction in their native ranges and are considered the rarest of all gazelles, so every birth is special and important to the survival of the species. Currently, there are fewer than 300 dama gazelles left in their native range. These animals have been disappearing as their habitats in areas, including Chad, Mali and Niger are devastated by livestock overgrazing, land development and uncontrolled hunting. Their native range is located in one of the least developed regions of Africa, where conservation actions to protect the species and their land can be challenging. The Columbus Zoo assists in efforts to save this species by providing support to the Sahara Conservation Fund (SCF), which monitors the dama gazelle population and their distribution in their native range. The dama is the largest of all gazelles, with adults weighing up to 165 pounds. They have a white body with reddish brown features – which can vary by region, the animal’s age and season – and both sexes have s-shaped horns. Dama gazelles typically give birth to only one calf at a time, after a gestation of five and half to six months. Like other gazelles, the dama may exhibit a pronking, or stotting, behavior in their native range to communicate with other members of the herd. This involves hopping from all four limbs, which appear to leave and touch the ground at the same time. Dama gazelle calves can run as fast as the adults in as little as a week of age. In addition to the dama gazelles born at the zoo, a male common eland calf, Donnelly, was born on Jan. 16, 2018 at The Wilds in Cumberland. The birth of this calf is particularly exciting as Donnelly is the first eland born at The Wilds in 17 years. The common eland is one of the largest African antelope species, and despite its large size, is remarkably agile. An adult eland can jump over a 6-foot fence from a standstill. Common elands used to live primarily throughout the savanna woodlands of eastern and southern Africa; however, they have been threatened by human populations as a result of civil wars and other conflicts in countries, including Uganda, Rwanda, Angola and Mozambique. The Columbus Zoo and The Wilds have supported conservation projects in these regions to reduce human-wildlife conflict as well as improve the condition of habitats shared by common elands and other species. Guests at The Wilds will have the opportunity to see the eland calf when The Wilds reopens for the season on May 1, 2018. In the meantime, visitors can book a Winter at The Wilds tour now and enjoy seeing the four white rhinoceros calves born at the end of 2017. The Wilds, one of the largest conservation centers in North America, is home to rare and endangered animals from around the world along with hundreds of indigenous species. The mission of The Wilds, a nonprofit organization, is to lead and inspire by connecting people and wildlife. The Wilds is located at 14000 International Road in Cumberland, Ohio, about 90 minutes east of Columbus. Normal hours of operation are 10 a.m. to 4 p.m. every day from May through September, and on Saturdays and Sundays in October. For more information, visit TheWilds.org.